English novelist; born Feb. 7, 1812, at 387 Mile End Terrace, Commercial Road, Landport, Portsea; died June 9, 1870, at Gadshill, near Rochester, Kent. 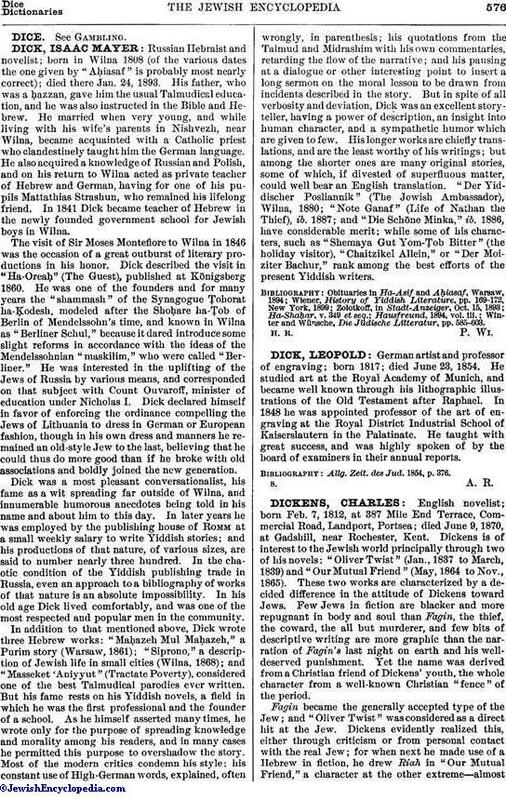 Dickens is of interest to the Jewish world principally through two of his novels: "Oliver Twist" (Jan., 1837 to March, 1839) and "Our Mutual Friend" (May, 1864 to Nov., 1865). These two works are characterized by a decided difference in the attitude of Dickens toward Jews. Few Jews in fiction are blacker and more repugnant in body and soul than Fagin, the thief, the coward, the all but murderer, and few bits of descriptive writing are more graphic than the narration of Fagin's last night on earth and his welldeserved punishment. Yet the name was derived from a Christian friend of Dickens' youth, the whole character from a well-known Christian "fence" of the period. Fagin became the generally accepted type of the Jew; and "Oliver Twist" was considered as a direct hit at the Jew. Dickens evidently realized this, either through criticism or from personal contact with the real Jew; for when next he made use of a Hebrew in fiction, he drew Riah in "Our Mutual Friend," a character at the other extreme—almostimpossibly, certainly improbably, good. In both "Oliver Twist" and "Our Mutual Friend" Dickens displays a lack of knowledge of the real characteristics of Jews. 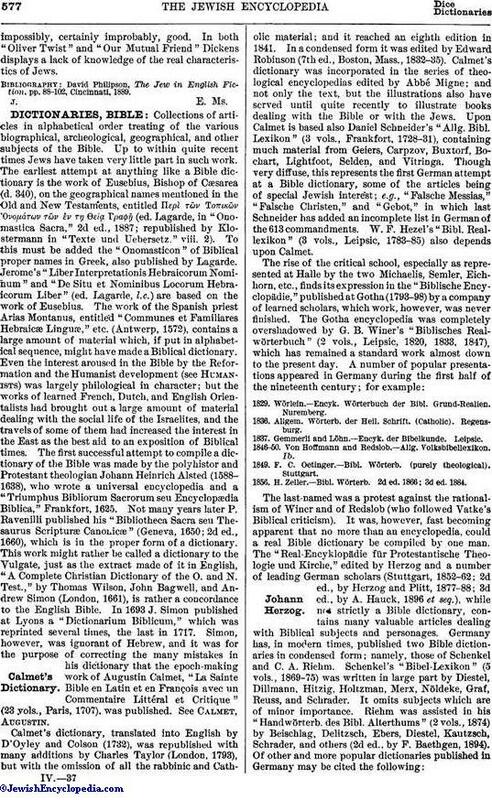 David Philipson, The Jew in English Fiction, pp. 88-102, Cincinnati, 1889.